Aims and Objectives: The aim of visual systematic screening is early identification of oral cancer (OC) precursor lesion. OC mortality improves when cancer is identified at early stages. This is important in patients whose lifestyle choices render them at higher risk of developing OC. This study described the prevalence of OC screening among smokers and nonsmokers in Kuwait and ascertained demographic predictors. Materials and Methods: This cross-sectional study utilized a self-administered online survey in English and Arabic through Survey Monkey® and disseminated using the social networking app “WhatsApp.” The survey included 21 questions on demographics, smoking status, and knowledge of OC. Screening questions were adopted from the Maryland Cancer Screening and Risk Behavior Survey. Data were analyzed using the computer software “Statistical Package for Social Sciences, SPSS version 24.0” (IBM Corp, Armonk, NY, USA). Results: The study included 404 Kuwaiti respondents, 311 (77%) nonsmokers and 93 (23%) smokers. Prevalence of OC screening was 7.2, 7.7% among nonsmokers and 5.4% in smokers. Only 36.6% were aware of OC, with more nonsmokers (38.9%) than smokers (29%). Logistic regression revealed twice more males likely to go for screening than females and with the likelihood of those being in the age group of 25–44 years four times more (P < 0.012) than other age groups. Conclusion: There was low prevalence of screening and poor awareness of OC among sampled. Increased efforts are needed by health professionals to spread awareness and improve knowledge on OC and demand the inclusion of screening during their routine and opportunistic oral examinations. Prevalence rates of OC vary in Arab countries. Numbers ranged from 2% to 18% for OC, among all types of cancers and up to 59% out of cancers affected the maxillofacial complex. Prevalence studies in Kuwait are lacking; however, in one report which estimated the 5-year prevalence of oral mucosal lesions, neoplastic lesions accounted for 15% of 858 biopsied lesions. Among these neoplastic lesions, oral squamous cell carcinoma was ranked highest, indicating delay in detection of precancerous lesions. The majority of OC are preventable., Lifestyle choices, oral hygiene practices, infections, and genetics contribute independently and synergistically to elevating the individual's risk of OC. The two most frequent lifestyle culprits implicated in the etiology of OC are tobacco and heavy alcohol consumption, with smoking identified as the primary etiological risk factor. The overall global direction shows that there is a decline in smoking in high-income countries; however, in low- and middle-income countries, there continues to be an increase in the use of tobacco products. In Kuwait, 2014 survey data reports that within nationals, 38% of males and 2% of females are current tobacco smokers. Consumption of alcohol and tobacco in some societies, especially developing countries, is more common among men compared to women; therefore, this type of cancer is more prevalent in males compared to females. Moreover, in some Muslim nations, where consumption of alcohol is forbidden by religion, underreporting of this important risk factor is possible due to social desirability. This study aimed to describe the prevalence of OC screenings within the general public. The differences in screening between smokers and nonsmoker were evaluated. The main aim of the study was to determine demographic and lifestyle factors which predict OC screening behavior among smokers and nonsmokers. The null hypothesis was that there is no difference between smokers and nonsmokers in their likelihood to screen for OCs. This cross-sectional study, conducted from November 2016 to January 2017, utilized a self-administered online survey on Survey Monkey®, which is internet accessible. Initially, the survey was developed in English, then translated to Arabic and back-translated to English by two independent bilingual speakers. Both language options for the survey were available online, and participants could choose the language they felt comfortable with. All participants completed an online consent form before proceeding with answering the questions. Our target population was Kuwaiti adults, 18 years and older, males and females with access to a smartphone device which has the social media application “WhatsApp” installed on it. To prevent duplicate responses, the online link deactivated if it detected the same internet protocol address attempting multiple access. The study was approved by the Health Sciences Center Ethical Committee, Kuwait University, letter #VDR/EC/2835. The survey included 21 questions investigating demographics such as age, gender, education level, income, smoking status and alcohol use, and time duration since last visit to the dentist, area of residence, and clinical symptoms. In Kuwait, nationalized dental and health services are available to and non-Kuwaiti residents through primary and tertiary care centers all over the State of Kuwait. 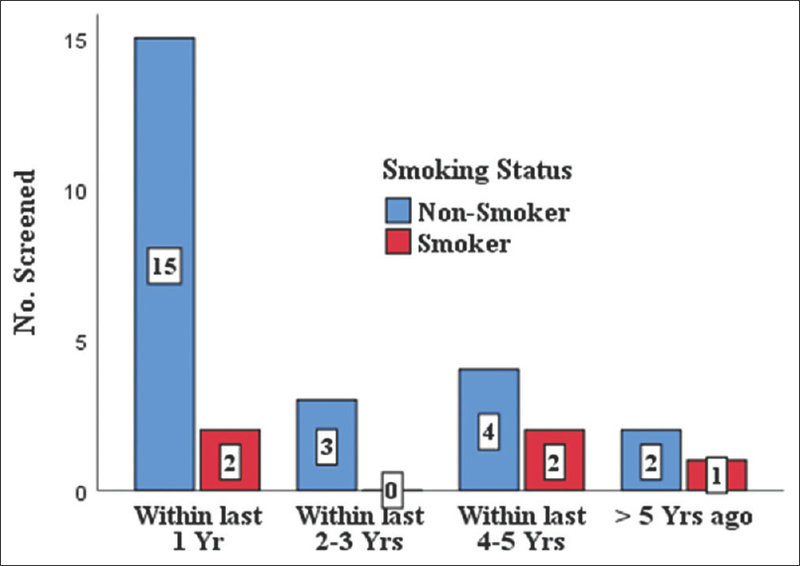 Smoking status was ascertained by the question “Do you smoke?” with three answer options: “No” grouped under nonsmokers, “Yes, but I quit” grouped under former smokers, and participants who answered “Yes” were considered current smokers. Alcohol consumption status was determined on a “Yes” and “No” basis, and no categories for level of consumption were given. The data management, statistical analysis, and graphical presentation were carried out using the computer software “Statistical Package for Social Sciences, SPSS version 24.0” (IBM Corp, Armonk, NY, USA). The descriptive statistics have been presented as frequencies and percentages for categorical variables. The quantitative variable, age, was ascertained for normal distribution assumption, applying the Kolmogorov–Smirnov test, and presented as median, IQ (Interquartile), and range. Median age between genders was compared using nonparametric two-sample Kolmogorov–Smirnov test, and the median age among three categories of smoking status with Kruskal–Wallis test. Chi-square or Fisher's exact test was applied to find any association or significant differences between categorical variables. Logistic regression model was used to predict the influencing factors for OC screening, (0 as not screened and 1 as screened). The two-tailed probability value “P” < 0.05 was considered statistically significant. Please see [Figure 1] for the study sample distribution per smoking status group. In the survey, a total of 404 Kuwaitis completed the questionnaire [Figure 1] including 243 (60.1%) females and 161 (39.9%) males [Table 1]. The overall median age was 32 years (IQ; 24-44) ranging between 18 and 65 years, with no significant difference (P = 0.186) between median ages of females (32 years) and males (33 years). The majority (79.5%) were university educated. Mostly, 54.4% were in the middle-income group, (Kuwait Dinar [KD] 500–1500) per month followed by (KD 1500 and above) and (>KD 500) each 29% and 16.6%, respectively. 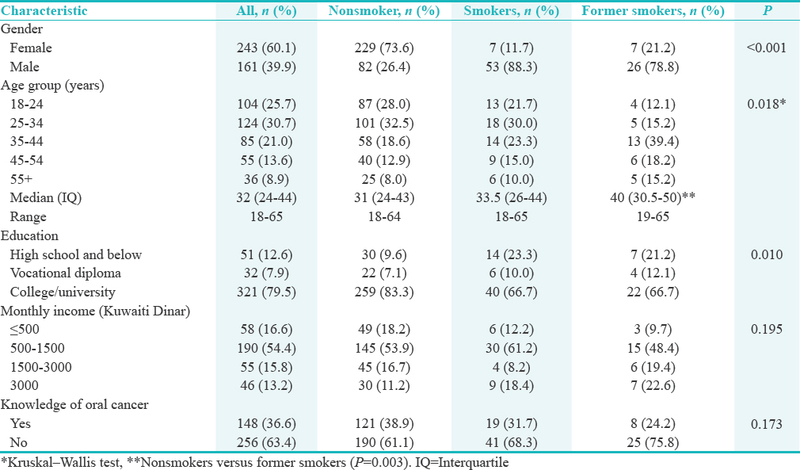 Of the total, 311 (77%) were nonsmokers and 93 (23%) smokers (60 current smokers and 33 former smokers) [Table 1]. The median age of smokers was found to be significantly higher (P = 0.026) compared to nonsmokers (35 vs. 31 years) and also with a significant difference among three groups (P = 0.018): former smoker, current smoker, and nonsmoker (40, 33.5, and 31 years), respectively. Gender and education were also found to be significantly associated with smoking status. Male smokers were significantly higher (P < 0.001) compared to female smokers, while higher education was associated with nonsmokers (P = 0.01). No significant association was noticed between income and smoking status (P = 0.195). Alcohol use was reported only by 19 (4.7%) of the respondents, significantly higher users among smokers than nonsmokers (11.8% vs. 2.6%, P = 0.001). Only 148 (36.6%) of the total respondents were aware of OC. No significant difference was noticed on knowledge of OC between smokers and nonsmokers (P = 0.173) though was higher among nonsmokers (38.9% vs. 29.0%). Knowledge of OC was found to be significantly higher (P = 0.006) among alcohol users compared to nonusers (8.8% vs. 2.3%). An overall prevalence of OC screening was 7.2%, 7.7% among nonsmokers and 5.4% in smokers [Table 2]. Screening was most prevalent among 25–44-year old, and those with university education and having higher income, KD 1500 or more (Approximately 5000 per month) (P = 0.01). A total of 29 screened, all were university educated having knowledge of OC. Of the total 29 respondents screened, 17 (58.6%) visited doctor within last 1 year, 9 (31%) within last 2–5 years, while three, >5 years ago [Figure 2]. No significant association was observed between smoking status and duration since last visited the doctor, though more nonsmokers visited within last 1 year. Logistic regression was performed to ascertain the influence of gender, age, and smoking on the likelihood of subjects going for screening. The logistic regression model was found to be statistically significant, χ2 = 31.3 (P < 0.001), explaining 12.7% (Nagelkerke R2) of the variance for screening and correctly classified 92.8% of the respondents. Males were 2.2 times more likely to go for screening than females [Table 3]. Furthermore, those in the age group of 25–44 years had 4.8 times more likelihood for screening (P = 0.012), than those in other age groups. Smoking was not found statistically significant factor for screening. The WHO report on the global tobacco epidemic published in 2015 reports that 38% of adult Kuwaiti males over the age of 18 were self-reported smokers, with only 2% of females in the same age groups, identify themselves as smokers. In regard to the youth (aged between 15 and 18 years), the prevalence of smoking was reported to be 25% among males and 8.5% among females. In our survey, findings showed lower percentage than that quoted nationally with only 14.8% identifying as smokers, of whom only 1.7% were females. Respondents in the age group of 25–34 years reported the highest rate of smoking. This may relate to the type of individuals who proceeded with answering the survey questionnaire distributed. Studies conducted in the Eastern Mediterranean Region on smoking among university student populations reported 25% current smokers among the adult population in Turkey, 29% in Jordan, 27% in Syria, and 21% in Iran. These numbers reflect a lower percentage than that published for Kuwait with regard to overall smoking population, but within the similar range as was found in our survey. A recent report on smoking prevalence and attributable disease burden conducted in 2015, found Kuwait to be one of the few countries worldwide with a reported significant annualized increase in smoking prevalence between the years 2005 and 2015. This finding is indicative of the continued engagement of the youth in high-risk behaviors and would explain our findings showing the highest rate of smokers to be among the younger segment of the population. On the risk behaviors related to OC, alcohol consumption was also examined. The alcohol consumption was reported to be low, 5% of the sample reported consuming alcohol. This may be attributed to the religious beliefs of the population, lack of access to alcohol, as it is not sold legally in the country and lack of social desirability. Our OC screening prevalence rate of 7.2%, 7.7% among nonsmokers and 5.4% in smokers is similar to work done in Sudan. Babiker et al. interviewed an emergency clinic sample in the city of Omdurman and found that among 500 clinic patients, only 6.8% were ever screened for OC. Regional studies documenting prevalence of clinician-performed OC screenings are scarce in the Middle East. However, extrapolating from national studies carried out in North American, low prevalence of OC screening is not an unusual finding. Among 5544 adults living in the State of New York, Junhie estimated 35% prevalence of OC screening, while Viswanath et al. estimated a 33.2% among 19,054 adults living in the State of Maryland., Moreover, 27% among 2526 North Floridian adults reported having received an OC screening examination in their lifetime. Our logistic regression model revealed that screening was associated with age and gender, whereby men had twice the odds of being screened compared to women. 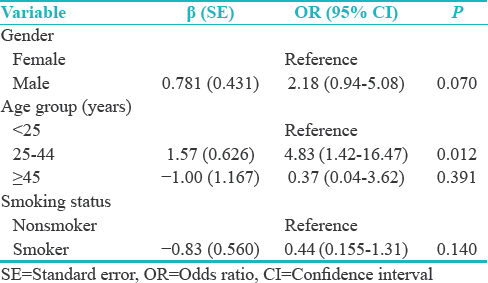 This is inconsistent with previous screening surveys where women and middle-aged people were at higher odds of being screened for OC.,,,, It is likely that results of this survey reflect the cultural and health-care structure of the Kuwaiti society and level of medical knowledge of the younger age group compared to other age categories. There are differences in the way health-care services are delivered in USA versus Kuwait. Health insurance is the main source of medical care in the US, while availability of health services is abundant in Kuwait, with 72 primary care centers hosting a team of health-care professionals scattered in the various administrative districts of Kuwait. This structure ensures 100% access for all residents of Kuwait regardless of country of origin. In spite of this, the prevalence of OC screening is not reflective of this health delivery structure. In a report that described barriers to OC examination among General Dental practitioners in the UK, it was stated that lack of time and lack of remuneration for this examination are significant barriers to conducting screening. Considering the importance of OC as a disease, it is worth noting that the American Dental Association treatment code on dental procedures and nomenclature (CDT code) does not treat OC examination as a separate entity, and therefore, does not enable dental professions to charge for the screening examination separately. This is contradictory to cancers of other systems and organs, where insurances offer reimbursement for preventative screenings and services. The patient awareness and knowledge of the constellation of the early signs and symptoms of OC is an essential driver in seeking early professional help. Our findings revealed that out of 404 participants, only one-third were aware of OC as a disease. Smoking status did not alter this relationship. This finding is consistent with previously published literature wherein a cross-sectional survey conducted at a University emergency clinic in the state of Kuwait, it was found that regardless of the smoking status; the clinic patient population had poor knowledge of OC signs and symptoms. Providing the population with the necessary information which can facilitate enhancing their medical background knowledge in OC is essential. This has to be adapted to their level of education and cultural acceptance. Knowledge of OC early signs and awareness of associated risk factors can be increased throughout communities by utilizing the advancements in communication technologies and popular usage of social media. In Kuwait, social media applications such as Instagram, Snapchat, and WhatsApp are becoming increasingly popular in disseminating local news and medical information. Many medical professionals utilize social media as a platform for raising awareness with prevalent medical ailment in the society and using socialites to endorse their health messages. Appropriate scientific literature is needed to determine the impact of modern technology as it compares to traditional methods of educating the population. By including Kuwaiti nationals only, the data had some strengths and limitation. It is the first report on OC screening among Kuwaiti nationals only; thus, no contaminations from screenings data that may have occurred in other geography. However, it obscured data from a large proportion of expatriate community in Kuwait, who could have had screening done locally. Our sample was recruited through a social networking app, which is a novel way to gain easy access to a large sample considering that approximately 8 out of 10 households in Kuwait have access to the internet through their homes. In 2015, a survey conducted in Kuwait revealed that almost 100% of respondents use a smartphone device. Another strength of this study is that we used a valid and reliable screening questions, which have been used in prior survey conducted internationally (Maryland cancer screening and risk behavior risk survey). However, it is worth being mindful that surveys are by self-report, and social desirability may play a role in how participants answer questions. One positive outcome, following dissemination of this survey, is that a population-led screening campaign was held in a large shopping mall in Kuwait, and during that event, approximately 700 patients were screened. This large campaign was very successful in terms of raising awareness among patients and professionals alike. This cross-sectional internet-based survey revealed that screening for OC was low regardless of smoking status. It also revealed that participants lacked the necessary awareness required to prevent the disease or seek the help of a health-care professional at early stages of the disease. The findings of the study suggest imposing compulsory continuing education for dental professionals, reinforcing the importance of screening among local dental schools, and exploring innovative ways to increase the level of awareness of OC in the population. Sankaranarayanan R, Ramadas K, Thara S, Muwonge R, Thomas G, Anju G, et al. Long term effect of visual screening on oral cancer incidence and mortality in a randomized trial in Kerala, India. Oral Oncol 2013;49:314-21. Ferlay J, Soerjomataram I, Ervik M, Dikshit R, Eser S, Mathers C, et al. GLOBOCAN 2012 v1.0, Cancer Incidence and Mortality Worldwide: IARC Cancer Base No 11. Available from: http://www.globocan.iarc.fr/Default.aspx. [Last accessed on 2016 Apr 04]. Al-Jaber A, Al-Nasser L, El-Metwally A. Epidemiology of oral cancer in Arab countries. Saudi Med J 2016;37:249-55. Peter Boyle P, Bernard L, editors. World Cancer Report 2008. Available from: http://www.iarc.fr/en/publications/pdfs-online/wcr/2008/. [Last accessed on 2016 Apr 04]. Morris RE, Mahmeed BE, Gjorgov AN, Jazzaf HG, Rashid BA. The epidemiology of lip, oral cavity and pharyngeal cancers in Kuwait 1979-1988. Br J Oral Maxillofac Surg 2000;38:316-9. Sciubba JJ. Oral cancer and its detection. History-taking and the diagnostic phase of management. J Am Dent Assoc 2001;132:12S-8S. Dost F, Do L, Farah CS. Lesion evaluation, screening and identification of oral neoplasia study: An assessment of high-risk Australian populations. Community Dent Oral Epidemiol 2016;44:64-75. Silverman S Jr. Demographics and occurrence of oral and pharyngeal cancers. The outcomes, the trends, the challenge. J Am Dent Assoc 2001;132 Suppl: 7S-11S. Downer MC, Moles DR, Palmer S, Speight PM. A systematic review of measures of effectiveness in screening for oral cancer and precancer. Oral Oncol 2006;42:551-60. Brocklehurst P, Kujan O, Glenny AM, Oliver R, Sloan P, Ogden G, et al. Screening programmes for the early detection and prevention of oral cancer. Cochrane Database Syst Rev 2010;11:CD004150. Centers for Disease Control and Prevention. Behavioral Risk Factor Surveillance System Survey Questionnaire. Centers for Disease Control and Prevention; 2010. Abu Shomar RT, Lubbad IK, El Ansari W, Al-Khatib IA, Alharazin HJ. Smoking, awareness of smoking-associated health risks, and knowledge of national tobacco legislation in Gaza, Palestine. Cent Eur J Public Health 2014;22:80-9. Csikar J, Kang J, Wyborn C, Dyer TA, Marshman Z, Godson J, et al. The self-reported oral health status and dental attendance of smokers and non-smokers in England. PLoS One 2016;11:e0148700. Al-Shammari KF, Moussa MA, Al-Ansari JM, Al-Duwairy YS, Honkala EJ. Dental patient awareness of smoking effects on oral health: Comparison of smokers and non-smokers. J Dent 2006;34:173-8. Joseph BK, Ali MA, Sundaram DB. Awareness of mouth cancer among adult dental patients attending the Kuwait university dental school clinic. J Cancer Educ 2018;33:340-5. Ling H, Gadalla S, Israel E, Langenberg P, Zhan M, Dwyer DM, et al. Oral cancer exams among cigarette smokers in Maryland. Cancer Detect Prev 2006;30:499-506. Macek MD, Reid BC, Yellowitz JA. Oral cancer examinations among adults at high risk: Findings from the 1998 National Health Interview Survey. J Public Health Dent 2003;63:119-25. Viswanath A, Kerns TJ, Sorkin JD, Dwyer DM, Groves C, Steinberger EK, et al. Self-reported oral cancer screening by smoking status in Maryland: Trends over time. J Public Health Dent 2013;73:261-70. Nagao T, Warnakulasuriya S. Annual screening for oral cancer detection. Cancer Detect Prev 2003;27:333-7. Babiker TM, Osman KA, Mohamed SA, Mohamed MA, Almahdi HM. Oral cancer awareness among dental patients in Omdurman, Sudan: A cross-sectional study. BMC Oral Health 2017;17:69. Majidi A, Majidi S, Salimzadeh S, Khazaee- Pool M, Sadjadi A, Salimzadeh H, et al. Cancer screening awareness and practice in a middle income country; A systematic review from Iran Asian Pac J Cancer Prev 2017;18:3187-94. Oh J, Kumar J, Cruz G. Racial and ethnic disparity in oral cancer awareness and examination: 2003 New York state BRFSS. J Public Health Dent 2008;68:30-8. Riley JL 3rd, Dodd VJ, Muller KE, Guo Y, Logan HL. Psychosocial factors associated with mouth and throat cancer examinations in rural Florida. Am J Public Health 2012;102:e7-14. World Health Organization. Health Systems Profile Kuwait. Regional Health Systems Observatory EMRO. Egypt: World Health Organization; 2006. Macpherson LM, McCann MF, Gibson J, Binnie VI, Stephen KW. The role of primary healthcare professionals in oral cancer prevention and detection. Br Dent J 2003;195:277-81. Wade J, Smith H, Hankins M, Llewellyn C. Conducting oral examinations for cancer in general practice: What are the barriers? Fam Pract 2010;27:77-84. National Center for Health Statistics. Health, United States, 2015: With Special Feature on Racial and Ethnic Health Disparities. National Center for Health Statistics; 2016. The Central Agency for Information Technology. Consolidated Kuwait National ICT Indicators Report. Kuwait: The Central Agency for Information Technology; 2016.